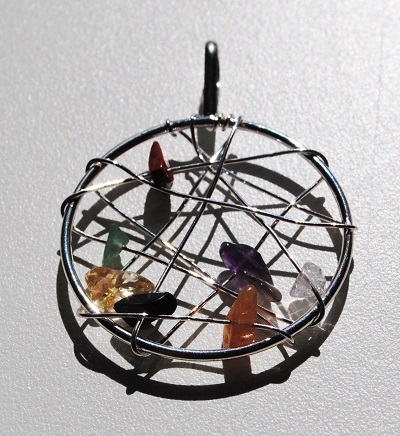 Dream catcher pendant with multi-colored quartz crystal chips. 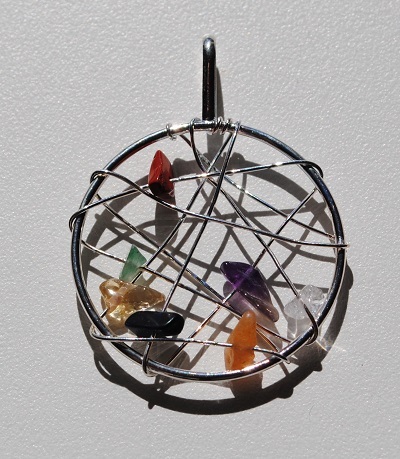 Lovely silver dream catcher pendant with multi-colored quartz crystal chips. 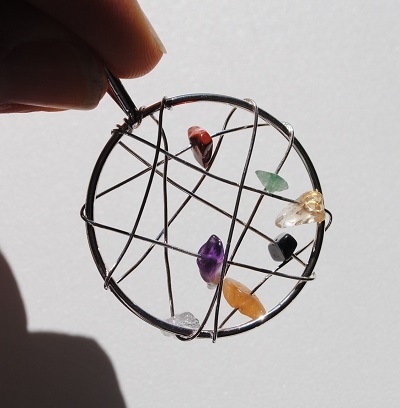 This silver pendant measures 1.2"/32 mm in diameter and has 7 little chakra crystal chips wrapped with silver wire forming the dream catcher. The Native American tradition of dream catchers originated with the Ojibway (Chippewa) Tribe of the First Nations of North America. It is said that a dream catcher filters a person’s dreams, letting the good ones go through and catching the bad dreams in the web. 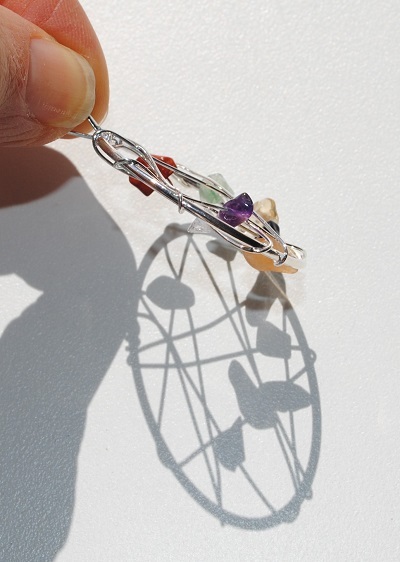 Dream catchers may be used as a sleeping charm protecting one from nightmares. The Ojibwa believe that a dream catcher changes a person's dreams. Good dreams would pass through the netting and float down like a feather, to the sleeper while the bad dreams are trapped in the web and disappear with the morning light. There is also the Lakota Indian legend of Iktomi who appears as a spider. Iktomi was a teacher of wisdom who spoke of the cycle of life. The spider web represents the cycles of life and connectivity. Iktomi’s belief was that “if you believe in the great spirit, the web will catch your good ideas. The bad ideas will be filtered out and go out through the hole in the middle of the net.” The web also reminds one to connect with the community to share ideas, dreams and visions.It has been said that the dream catcher captures the destiny of your future through all the goodness in your dreams. Dream On.